So it’s all over! 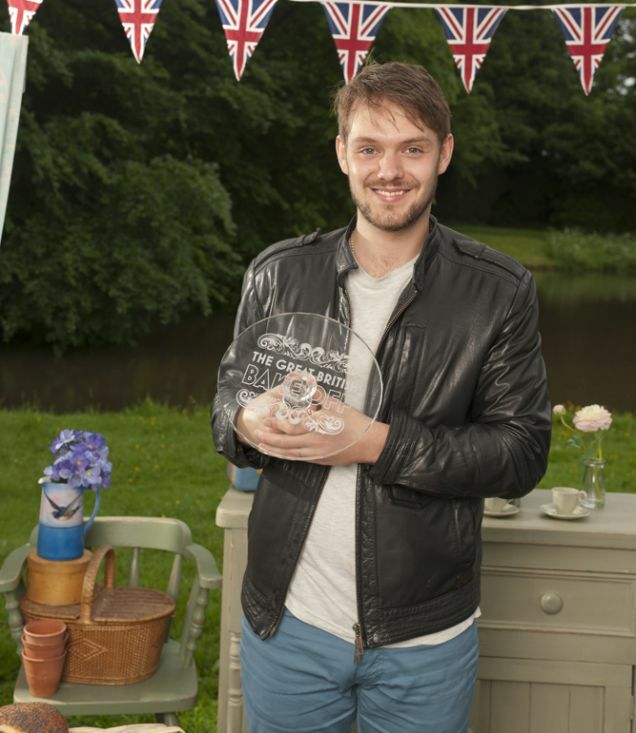 Great British Bake Off series three finished last week with John being crowned the winner. I think John is great, he’s passionate and talented, plus a fellow Mancunian! He will go on to great things. I can’t deny though that I wasn’t disappointed for Brendan. I have backed him from the start and I was convinced he was going to win. However, I don’t think coming joint second takes anything away from how talented and dedicated Brendan is. I think James will end up being the Heston Blumenthal of baking! He experiments everywhere he can and has a real understanding of the science of baking. Perhaps GBBO wasn’t the best venue for some of his experiments, but it shows how brave he is. The final began with the final three bakers making a Pithivier. This is a traditional French pie made by enclosing a filling in between two layers of puff pastry, and is typically decorated with a scalloped edge. They look really delicious! 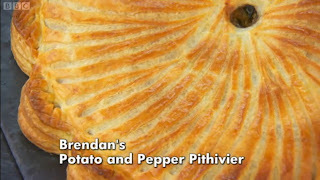 Brendan made a Potato and Pepper Pithivier (pictured above), which was beautifully decorated and the judges loved. 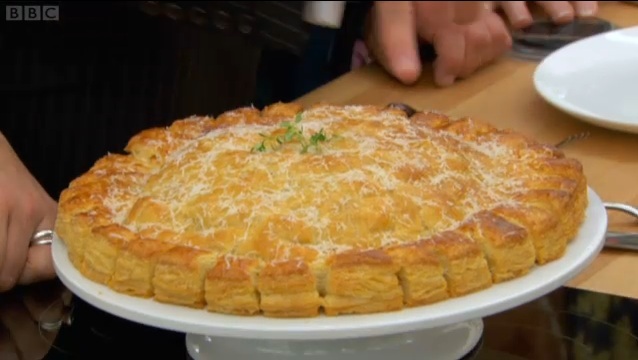 John made an Italian Sausage & Roasted Veg Pithivier (pictured below), which also went down very well with Mary and Paul. 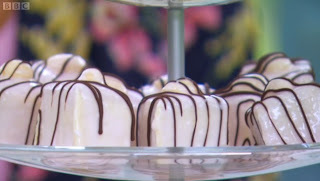 The technical challenge this week was French Fancies. I have made these before (see post) but my version were a lot more simple than the ones the bakers had to make! They looked so fiddly, messy and really hard to get right. No one did very well on this challenge and they all struggled. I would recommend my simpler version if you want to try these! I would loved to have seen the process of how to do them right, but unfortunately this stumped all of our bakers this week. In the final episode we also heard from past contestants, and the final three’s families. It was really nice to hear more of their back stories and see all the support they have from family, friends and fellow contestants. Everyone was so nice this year and it was great to see all the other bakers at the Summer Fete. 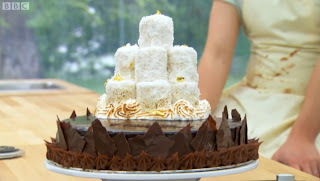 The showstopper challenge was to make a chiffon cake themed by each baker’s personal summary of 2012. Chiffon cakes are extremely light and made by folding beaten egg whites into the batter. They do not contain any butter. John made a Heaven & Hell cake (pictured above) to represent the ups and downs of his year. Heaven was represented by lemon and coconut, and hell by chocolate and orange. The judges were blown away by his cake, doesn’t it look stunning? 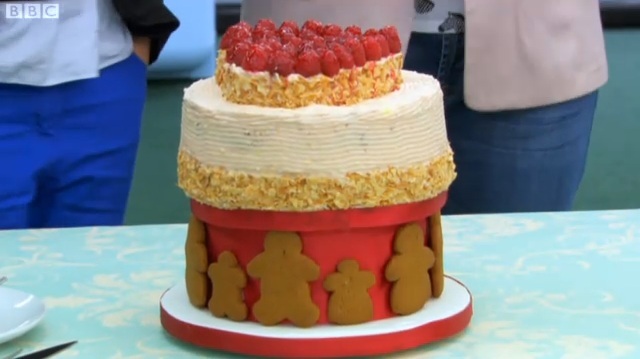 Brendan’s almond and raspberry cake had a theme of Family Reunion. I thought this was really sweet and obviously something close to his heart. He decorated the cake with gingerbread people. It was beautifully decorated and presented. James made five cakes! He wanted to represent the Olympics and the coming together of the different parts of the UK. His idea was fantastic and had he had more time, would have turned out much better. Unfortunately the time constraints of the competition affected his bake. I decided to make profiteroles this week. The bakers made choux pastry last week, and seen as I’ve already made French Fancies I thought I would give choux a go. 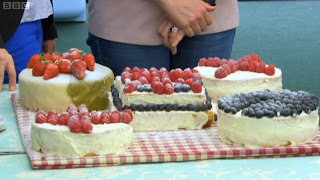 Maybe I am cheating a little bit here on my GBBO challenge (ok I am cheating!) but these were so delicious it was worth it! I started by sifting 60g plain flour into a bowl. Hold the sifter up high to let plenty of air into the flour. In a saucepan melt 50g butter and 150ml water on a low heat. Bring to the boil, then take of the heat and throw in the flour straight away and mix in with a wooden spoon. In will form a very smooth dough, as below. Let it cool for 10 minutes. Beat 2 eggs and add them to the saucepan, mix in well till a smooth glossy paste forms, as above. Using a teaspoon I put blobs of the mixture onto a lined baking tray. I baked on 220C/425F/Gas Mark 7 for 20 minutes. 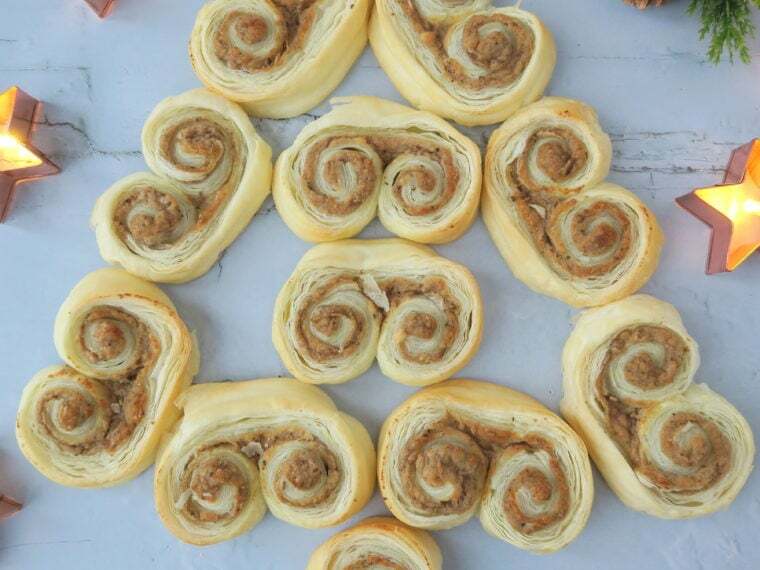 Until the mixture puffs up and goes golden. While the profiteroles are baking, whip up a pot of cream. To make the chocolate sauce I melted 200g chocolate (milk and/or dark), 2 tbsp golden syrup, and 25g butter. My chocolate sauce tasted good but was quite grainy. I imagine this is to do with the quality of the chocolate. Better quality chocolate is always better. When the profiteroles come out of the oven, pierce them with a knife to allow steam to escape, return to the oven for a couple of minutes, then take out and place on a rack to cool. Add cream by either piping into the profiteroles, or slicing them and spooning in. I was lazy and spooned in, the evening I made these I didn’t have the energy! Plus just between friends a bit of messy presentation is ok. For a dinner party I’d make the full effort. Pile up the buns, drizzle over the chocolate sauce and eat immediately! These are so good, light airy and melt in the mouth, although anything with cream and chocolate on tastes pretty amazing! I was surprised at how easy these are to make. I can see these being a regular feature in my life, and more choux baking to come! Lovely profits Kat! They look so yummy. I've got to find out how you're actually supposed to do those fondant fancies. I've only ever eaten Mr Kipling ones but I can eat a whole pack in no time at all! I didn't realise how difficult they are until the final.